We understand that privacy is essential in your business. Sometimes you need to separate yourself from everyone else to focus on your task, and partitions and cubicles are the ideal tools for this purpose. At ROF Furniture, we have a wide selection of partitions and cubicles to suit your needs. These panel systems also come in the following fabric colors: blue, gray, mauve, green, oatmeal and wheat. Each partition is easily installed; you simply place it, unlock the partition and pull it open, then position it as desired. Partitions and cubicles work wonderfully to divide the office into organized groups. ROF Furniture goes through a rigorous quality inspection to make sure they are providing you with the best new, used and refurbished partitions and cubicles around. 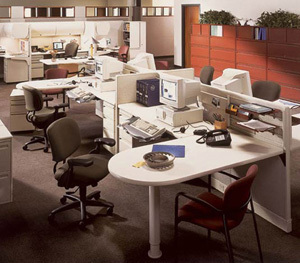 We are confident you will not be disappointed with any of our workstations furniture, including movable partitions, cubicle panel options, and other green office products.